In today’s times kitchen is just not an ordinary place of the house, instead it has become “the” room. A kitchen has become a place where you cook, enjoy and entertain yourself. A kitchen should not only be a place where you cook, but a place where you can enrich your day. For a kitchen to be lively, it is important that the kitchen design should be attractive and beautiful. A good kitchen design is the one which is beautiful, functional and sustainable. For a good kitchen design it is essential to have a very unique kitchen cabinet wherein you can keep all the kitchen utilities. But the normal kitchen cabinets have a boring wooden look which does not energize or excite you. If you are a type of person who loves the glossy textured things then the European kitchen cabinets are best suited for you. The European style kitchen cabinets have a unique glossy finish that adds a shine in your kitchen. 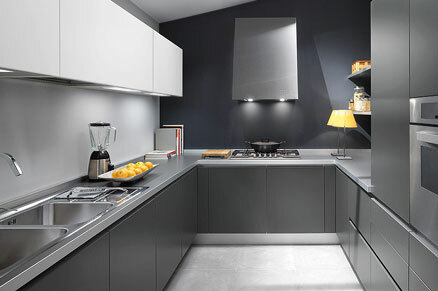 These European kitchen cabinets have a very modern and electric look, besides that they do not lack in functionality. Their USP are the beautiful colors in which they are available. You can choose the right color and finish for you cabinet. These European style kitchen cabinets will add a dramatic effect to your house. Modern European kitchen cabinets in combination with stainless steel appliances. Photo courtesy of FURNISHism. With their electric colors like blue, green, maroon, etc. the European kitchen cabinets make your kitchen very lively and attractive. Apart from the electric colors these cabinets are available in very artistic shapes which will add a modern look to your kitchen. The European kitchen cabinets are best suited for enclosed kitchens and kitchens with open floor plans. These cupboards will enhance the area of the kitchen and make it look bigger in size. This is particularly because of their finish (matte, glossy, etc.) and their clean and sharp angles. The European style kitchen cabinets are suitable for those people who want to have a good design kitchen cabinet at a cheaper price. Though these European kitchen cabinets are quite cheaper but you cannot doubt their quality and strength. They are made of good quality material that last long. Their stylish and sleek looks make them the favorites of women who never compromise on the style quotient. There are basically three types of European kitchen cabinets. These three types are explained briefly in the following paragraphs. This is the first category of European style kitchen cabinetry. Its special feature is its edged top and bottoms with some carvings. Generally these cabinets are made out of pine wood as they have simple wooden patterns. These European style kitchen cabinets are not always made up of wood. Generally Formica panels are used to give them a sleek and streamlined look. They are available in bright and electric colors like red, blue and green. These European kitchen cabinets have glass doors that make them look much more dramatic. These kitchen cabinets are known for their smooth designs, innovative technology and unusual materials. They have clean and sharp angles which are truly unique and give a smooth appearance. The third and the last type of European style kitchen cabinets are the French country style. These types of cabinets are very warm and richly stained for creating an intense traditional design. These cabinets are even hand carved to create an intricate design. These European kitchen cabinets generally use wood which have a rustic and knotty appearance. The above mentioned types of European kitchen cabinets are very unique and exclusive. Their design and pattern are very different from any other kind of kitchen cabinet. These cabinets are simply a must buy for the people who love to make their house colorful and attractive. Apart from being lively, the European style kitchen cabinets are quite affordable. So if you want a sleek and stylish cabinet at a cheaper price, you can undoubtedly opt for a European style cabinet. Though they are stylish but they do not lack in functionality and durability. Amazing kitchen! I like the glossy texture and the modern look. I think this kitchen is also very easy to clean.